Typing technology has come a long way since its inception in the 1700s. Manufacturing of actual typing devices took many more years and the first generation of these devices was introduced in 1870s. Since then such devices have undergone continual evolution through minor and major updates alike. Mechanical keyboards of today are much more refined, thus capable of typing characters far more quickly and efficiently with greater accuracy. The improvements that have been developed in technology, design and layout lead to availability of present day mechanical keyboards. What steps have been taken to perfect this integral input device that the daily lives and jobs of literally millions of people revolve around? Read on to discover the history behind the evolution of modern mechanical keyboards. Present day keyboards are based on typewriters. If you are not a millennial kid chances are high that you must have seen a typewriter. The first typewriter manufactured was of the model similar to a sewing machine opposed to your thinking of what a typewriter looks like. Well beginning is always weirder than we think. Reason behind this atheistic similarity was the brand Remington, that manufactured the first typewriters and they were also sewing machine manufacturers and this led to design coincidence. Remington’s Sholes & Glidden typewriter is the first commercial typewriter. However between the period of 1830 and 1870 many typing machines were patented apart from one mentioned above but none were able to reach commercial production. It was the collaboration between Sholes, an inventor and technologist; Glidden, a mechanic and Soule, a printer that changed the definition of typing forever. Soon the first typewriter came into existence but Sholes and Glidden were not satisfied with its slow sales. Frustrated they sold the patent of the machine to Densmore and Yost. After commercialization of typewriters a standard in design was reached by 1910. All typewriters by then had somewhat similar design. The major change in design came when in 1961; IBM introduced the IBM Selectric typewriter. The Selectric typewriter used typeballs instead of type-bars for printing letters. This solved the common issue of typewriter jams that frustrated the typists. Speed and efficiency of typing was also increased. Also mechanism to change typeballs gave freedom for the first time to change fonts in the same document. The Selectric typewriters were in production till 1980 when the era of computers was on the rise. The sudden emergence of computers as consumer friendly product in the 1970s made keyboards the primary input device for all typing work. Computers evolved from entire room occupying ENIAC machines that functioned with punch cards for input to BINAC that used electromagnetically controlled input devices called teletype. Interesting fact here, we all presume that PCs come with keyboards, but this far from reality in the 1970s. If you wanted a standard keyboard back then you had to buy it separately. IBM started selling their electric typewriter in converted form for use with personal computers. Then along came IBM with their iconic Model M keyboard in 1984. The Model M was a buckling spring keyboard constructed so well that it gave unmatched accuracy and comfort to typist. The buckling spring mechanism gave users a distinct tactile and audible feedback unmatched by their competitors, but the price was prohibitive to budget computing. By the 1990s cheap rubber dome with membrane keyboards were in full production and would soon dominate the mass market. These boards were lighter and quieter, making them the preferred method for the laptop generation. Rubber dome keyboards were much less expensive to produce and the luxury of a mechanical keyboard was left to the enthusiasts. The modern mechanical keyboard ideally has individual switches under every key. The technology is not new as such, but the production and engineering has changed a lot over the years. Remember the membrane keyboards mentioned above? There’s no doubt that those keyboards made PCs more affordable and portable, but they also made enthusiasts crave for something else. Membrane keyboards were slim and had low key-press distance, but people started missing that audible feedback and tactile feel of the mechanical keys. As a response, manufacturers started producing mechanical switch keyboards there were a revised version of older buckling spring keyboards. These mechanical keyboards returned the “clicky” typing experience and were soon were adopted by the PC gaming industry as well, though among gamers the non-clicky linear switches are more popular. Cherry MX Black – These switches have a smooth, non-clicky linear press. The key press is registered before the key reaches bottom, but there is no tactile “bump” present to notify typist of key registration. A heavier gaming focused switch. The Steelseries 7G gaming keyboard and the ThermalTake Meka G Unit are a couple example keyboards using this switch. Cherry MX Red – Another linear, top-to-bottom switch; the difference is MX Reds require a lot lesser actuation force to reach the key bottom than the Black switch. PC gamers claim this makes the keys smoother and makes for quicker response times in fast paced shooters. The single most popular switch for gaming keyboards. The Corsair Vengeance K60 gaming keyboard is a notable mech using Cherry MX Reds. Cherry MX Brown – These switches are hybrids, suiting the needs of gamers and typists equally. A tactile bump is present, which gives you freedom from pressing the key all the way down (bottoming out) to register the press. This makes touch typing even faster. Das Model S Ulimtate and Logitech’s G710+ Mechanical Gaming Keyboard use these switches. Cherry MX Blue – Extremely popular among typists. These switches offer a tactile bump and “clicky” sound. The Razer BlackWidow Ultimate keyboard uses these switches. Cherry MX Green – Heavier version of MX Blues. These switches require more force for a press down. Commonly used for the spacebar. Cherry MX Clear – Not a good choice for light typers, actuation force of these switches is very high. You have to exert more force than any other switch to register a press as the actuation force reaches a peak of 95g. Still some heavy typists prefer mechanical keyboards with these switches. Mechanical keyboards are chosen by tech enthusiasts for many reasons. These keyboards minimize the typos. Sound produced when pressing keys have a tactile feedback effect that prevents typo errors. They stand the test of time. Mechanical keyboards are known to be longer lasting and easy to clean. Bottom line, they function efficiently and more accurately to improve response time and typing speed. 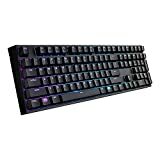 The Cooler Master MasterKeys Pro L at Amazon is a premium, full size RGB backlit mechanical gaming keyboard with Cherry MX Red (linear), Blue (clicky) or Brown (tactile) switches, N-key Rollover, macros support, and a detachable braided cable. MechType is a blog dedicated to input devices that use mechanical switches. I review keyboards and share my opinions with the community. Disclosure: I participate in affiliate programs, such as the Amazon Services LLC Associates Program, which provides a means for sites to earn commissions by advertising and linking to Amazon.com. HAVIT HV-KB390L Review: Best Low Profile Mechanical Keyboard? Vortex CORE Review: Viva Tiny Mechanical Keyboards! Clicky vs Tactile vs Linear – Which Switch Type Fits You Best?